This is a circuit board to for an add-on board for a Raspberry Pi B+ that will control two stall-motor turnout motors for a model railroad. It also has sense logic to return the state of the turnouts, using one pole of the DPDT contacts in the stall-motor (typical of Tortoise stall-motors). GPIO Pins Used and stacking restrictions. Motor Select 1: select the position of stall motor 1. Motor Select 2: select the position of stall motor 2. Point Sense 1: return the state of the points for stall motor 1. Point Sense 2: return the state of the points for stall motor 2. Each of the motor drive circuits is through a transistor that can handle 1 amp continuous collector current, which is way more needed to drive typical stall motor. It is enough to drive a pair of stall motors, wired in parallel as would be the case for a cross over. This circuit contains two sections. 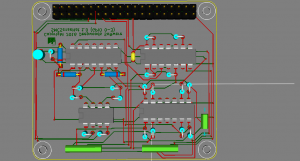 There is an output section that contains a dual opto-isolator, a quad op-amp, and a quad driver (NPN) transistor. An opto-isolated GPIO output pin drives one pair of op-amps, which in turn drive a pair of driver transistors. Each GPIO output pin drives its pair of op-amps on their opposite plus and minus inputs, thus driving only one or the other of this pair of op-amps at a time. That is the GPIO output pin drives one op-amp on when the GPIO output pin is high and drives the other op-amp on when the GPIO output pin is low. On the output side only one of the pair of driver transistors is on at a time. This results in only one or the other of the motor drive connections at ground (-) and the other pulled up to 12-16 Volts (+). This causes the stall motor to rotate in one or the other direction, moving the turnout points one way or the other. 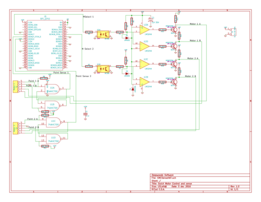 The other section is a pair of flip-flop debounce circuits, one for each of two SPDT switch contacts that report the position of the turnout points. The output of these flip-flops goes to a pair of GPIO input pins. Parts list for SMCSenseHAT or SMCSenseHAT1 boards. The only parts that might be substituted are J0 (the RPi GPIO Header), and T1 and T2 (the Motor terminals) and T3 (the 12 to 16 Volts terminals). The parts listed are for the stacking headers for the RPi GPIO Header, and screw terminals for the Motor terminals and the motor power terminals. Feel free to select a non-stacking header for the RPi GPIO Header and to select either pin arrays or spring terminals for the T1, T2, and T3. Board assembly is straight forward. You need to be careful orienting the ICs, diodes, and the electrolytic capacitor. The first batch of the boards I ordered used the wrong PCB modules for the terminals and the holes are too small for the screw terminal pins to go all the way in. They can be "jammed" in enough to be soldered. Pin arrays fit a little better, but still need some effort to seat. The next batch I order will not have this problem. 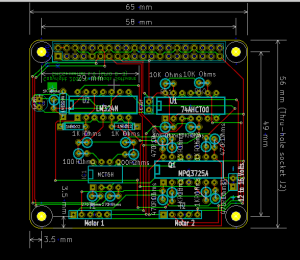 This board is supported by the Model Railroad System OpenLCB_PiGPIO daemon. A basic XML file for it is included in its GitHub folder. This board is available on EBay here: http://www.ebay.com/itm/132601715618?ssPageName=STRK:MESELX:IT&_trksid=p3984.m1558.l2649.